Help plan the future of Los Angeles State Historic Park. Click for full flier and announcement at LASHP website. > Ever wonder when State Parks would create that “world class park” at the Cornfields? The long-stalled planning process for the master plan at Los Angeles State Historic Park is getting underway again. Due to state budget issues, finalizing of the preliminary designs never happened, and the “interim public use” park at the site has been looking a bit less interim. Attend a community meeting about the future of the park on Thursday December 9th at 7pm at L.A. Conservation Corps, 1400 N. Spring Street, L.A. 90012. > Ever wonder what the western United States might have looked like if state boundaries followed watersheds? (Well, not even we creek freaks actually wonder that, but I thought it sounded good.) Take a look at John Wesley Powell’s proposed map of watershed-based western states (via Big Think.) Thanks to Melanie Winter of The River Project for bringing this to our attention. >Ever wonder about the future of that river-adjacent vacant area between the 4th and 6th Street bridges downtown? Blogdowntown, in an article entitled Nothing is Simple Down by the River, tells about competing plans for a jeans factory, expanded Metro rail operations, and a river park. >Ever wanted to tell your L.A. River story? Join KCET Departures’ story share on Saturday December 4th. A Los Angeles based non-profit corporation is looking for a part-time website supervisor who is a writer, editor, photo editor and more. We are launching in January a new website that is all about the Los Angeles River: a recreational guide, photo gallery, revitalization information, news, event guide, etc. The candidate should be self-motivated, able to work at home, set their own schedules and deadlines, a skilled web pro, a careful content checker and a totally responsible professional. A minimum of two years of writing and editing of professional consumer publications and two years of website creation/maintenance experience is required. The candidate should be proficient in maintaining websites, including using CMS tools, weblinking, photo cropping, resizing, and uploading. This jack of all trades will be doing the primary website supervision, updating, user content review, blog supervision, news linking and more. You will need three professional references and a salary history. Passion and experience with outdoor recreation and/or the L.A. River is real plus. •Compensation: Monthly salary to be negotiated once the time requirements are better understood. •This is a part-time job. Read the full ad and respond here. L.A. Creek Freak is looking forward to many more L.A. River websites! The more the merrier! Well… it’s due out in “mid-October” and it’s not quite out yet… but L.A. Observed and LAist announced it, so Creek Freak figures we better get on the bandwagon quick! The aptly-named John Arroyo wants you to map the Los Angeles River. John Arroyo is a native Angeleno who is doing his Urban Planning master’s thesis at the Massachusetts Institute of Technology (MIT.) He’s studying the interactions between culture and movements afoot to re-envision and revitalize the river. He defines culture pretty broadly – from informal to formal – from graffiti to poetry to dance to you name it. What types of cultural activity are occurring along the River and to what extent? How can the lessons learned from the River’s cultural activity patterns play a role in the River’s transformation and inform public policy and urban design to create and sustain spaces for cultural expression? One tool he’s using is community-generated mapping. He’s distributed a blank map that he’s asking anyone interested to fill in and mail back to him. He’s posted a blank downloadable version and a cool filled-in example here. Get mapping! Look ma, I’m a consolidator! Aquarium of the Pacific’s New Watershed Exhibit – Los Angeles Times blogger Louis Sahagun profiles the Long Beach aquarium’s newest and greenest exhibit with a three-dimensional model of the Los Angeles and San Gabriel Rivers. The content sounds great, and it’s all wrapped up in a LEED-certified green building. I am hoping to take some neices and nephews down there over the holidays for an on-the-ground review – keep your RSS tuned to LA Creek Freak. Beginnings of the Verdugo Wash Greenway? – City of Glendale approves community garden site along the Arroyo Verdugo. Piscine Pasadena Project Procures POWER Prize – Pasadena Now reports that the Central Arroyo Seco Stream Restoration project, which restored habitat for the threatened Arroyo Chub, was honored by Public Officials for Water and Environmental Reform (POWER.) Kudos to the city of Pasadena and the Arroyo Seco Foundation! They deserve a round of applause. Jenny Price leads Friends of the Los Angeles River’s first tour of the Lower Los Angeles River this Sunday December 7th. Bus departs from the River Center at 9am. The city of Los Angeles is hosting a couple of public hearings about the River Improvement Overlay zone (called the RIO and reviewed by Creek Freak here.) These take place on Friday December 12 at 12 noon in Van Nuys, and Monday December 15th at 8am at City Hall. Urban Photo Adventures hosts a photo safari through the gritty industrial underbelly of the mighty Los Angeles River on Saturday and Sunday December 13th and 14th. “New Lousy Economy Pricing!” Well organized and highly reccommended and docented by author/illustrator/blogger Joe Linton. Creek Freak reviewed here and posted more photos here. Great recent images and rave reviews at Urban Photo Adventures site. And don’t miss the downtown Los Angeles Library’s ongoing “L.A. Unfolded” historic map exhibit (reviewed here.) It’s up now and continues through January 22nd 2009. Creek freak got a chance to check out the new L.A. Unfolded map show at the downtown Los Angeles main library. It’s very fun, and reveals plenty about the historic courses of our waterways. The exhibition is up right now in the library’s 2nd Floor Getty Gallery, and continues on view through January 22nd 2009. 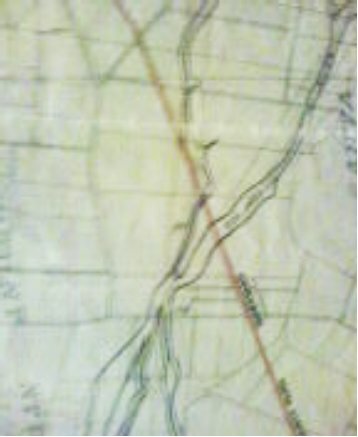 1919 Map detail of Confluence of the Los Angeles River (runs from top to bottom in the middle of the image) and the Rio Hondo (enters at top right) in present day South Gate. Diagonal red line is railroad tracks. 2008 Aerial Photograph of Rio Hondo Confluence. Diagonal railroad tracks still visible. LA River and Rio Hondo are now straight lines. Curved north/south line is the 710 Freeway. As a River aficionado, I especially enjoyed the Map of the Los Angeles River from Los Angeles City Limits to the Pacific Ocean, Office of Engineer M of W, LA & SLRR (Maintenance of Way, Los Angeles and Salt Lake Railroad), dated June 1919. It’s about 5-feet by 2-feet, drawn in fine black and red on delicate semi-transparent white linen. The outline of the river’s channel is in black on the (unfortunately poor quality cell phone) picture on the left below. The 1919 map actually has the contours of the later concrete channels penciled in (hopefully they weren’t available as early as 1919 – the concrete channelization didn’t get underway until the 1930’s,) though they’re hard to see in this photo. Another very beautiful map is the Map of the City of Los Angeles 1884, by H. J. Stevenson “U.S. Dept. Surveyor.” [Actual period after the word surveyor.] It’s about 4′ tall and 2 1/2′ wide and in full color. The river’s channel has plenty of curvy meander in the areas above and below downtown… but the railroads are already present downtown and the river has been straightened from about 1st Street to below 6th Street. The map also labels the Zanja Madre (Spanish for “Mother Ditch” – the original ditch/canal that brought water from the river to the pueblo) running through the Cornfield (now Los Angeles State Historic Park) site. There’re lots more maps – from hundreds of years ago to the present day, representing sites from the original Pueblo to Japantown to the murals of East L.A. Even maps showing California as an Island. It’s a great exhibit that I highly recommend and look forward to spending more time with. Calabasas’ Award for Concrete Removal: On October 2nd, the Acorn reported that the city of Calabasas’ Las Virgenes Creek Restoration Project was honored by the American Society of Civil Engineers Metro Los Angeles Branch. Read about the project here. Say It Ain’s So: On September 29th Blogdowntown reported that studies show that the 6th Street Bridge will need to be replaced. This 1931 bridge is magnificent. Creek Freek fears that city proposals to widen it into a mini-freeway will be a travesty. I hope to blog about this sometime soon. The city of LA’s Stream Protection public meetings continue, Friday October 10th (1:30pm at City Hall) and October 17th (7pm at the Marvin Braude Constituent Service Center in Van Nuys.) It’s important that environmentalists attend! L.A. Unfolded: Maps from the Los Angeles Public Library opens at the Downtown Los Angeles Central Library’s Getty Gallery next week. Rumored to have some incredible old maps of the Los Angeles River, the exhibition will be on display from October 15th through January 22nd 2009. The Venice Neighborhood Council, Heal The Bay, Santa Monica Baykeeper and others host a State of Our Ocean Town Hall Meeting – Thursday October 23rd at 6pm at Westminster Avenue School, 1010 Abbot Kinney Blvd in Venice. Concerned Bicyclists of the Ballona Creek host the inagural Tour de Ballona on Saturday October 25th departing at 11am at the Culver/Sawtelle entry to the Ballona Creek bikeway. CBoB came together to make the Ballona Creek bike path safer. Jenny Price leads Friends of the LA River’s river tours: Sunday October 26th and Sunday December 7th. The December tour starts in Long Beach and marks FoLAR’s initial regular tour of the Lower Los Angeles River. Join LA City Council President Eric Garcetti for A Day at the River – Saturday November 8th from 9-11:30am at Crystal Street Bicycle Park in Frogtown. Urban Photo Adventures hosts Unexposed: the Los Angeles River photography tour on Saturday and Sunday November 8th and 9th. More of their great photos here. You are currently browsing entries tagged with map at L.A. Creek Freak.